With Mister Ed's help, I believe that I have learned how to stop the leak coming from Scampy's gray water tank. Yesterday I attempted to repair that leak by using ABS cement to re-connect the dump valve assembly to the gray water tank. The result was that the leak returned! 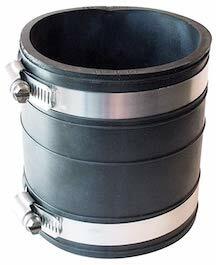 Today I am going to connect the dump valve assembly using a hub coupler. This should permanently fix this leak problem! It has taken me all this time since my 9:45 am Blog post to get back to you to let you know what happened. 1. It took an hour to drive to the RV place for the hub coupler [Which I did not buy after all]. 2. I spent about two hours messing with dump valve plumbing. 3. I am unable to install the Hub Coupler because the Gray Water Dump Valve Assembly will not come loose from the tank. You may remember that yesterday I used ABS cement to attach the Gray Water Dump Valve Assembly to the tank's drain. It now appears that the leak may be coming from a break at the tank's drain. 4. I am using silicone sealant to try to close off the leak. However, the instructions for the silicone sealant state to wait for 12-hours before exposing the sealant to water. 5. By using a steel bracket and a clamp, I have wedged the place where I've put the silicone sealant into a tightly closed position. If the silicone sealant does not do the job, a new grey water tank will have to be installed. I've installed a gray water tank once before. It was ordered from the tank factory located in Canada. Until the tank stops leaking or a new tank is installed, I will not be using the sink. This means no cooking using Scampy's kitchen!! That’s exactly what I used on my old Winnie for the same problem. Where was your leak coming from? Gray water leaking from the connection. It had one of those couplers which I replaced. Don’t know if it was original as it was already 25 years old when I replaced. There was a flange on the gray tank. You've probably seen it advertised on TV. Silicone is no good too soft to spongy and it takes to long to cure. 1. Are you thinking that the silicone fix is going to fail? 2. Another thing, Ed. The place where the leak is located is NOT a place where a good snug wrap may be made. 3. I am going to wait until tomorrow. The silicone will be set by then. If it does leak, I am inclined to buy a new tank. Click [Here] to see the tank that I may buy. I think what Mr Ed is talking about is Eternabond tape. It works well and will stick to anything EXCEPT SILICONE so clean off all the silicone you can and then apply the Eternabond. I know about and have used Eternabond. In my opinion, Eternabond is not able to stop this leak. George, is it just a leak or is the gray water tank gushing? Am I correct in assuming there is nothing wrong with the black water tank? Want to tell you a little story. Our very first camper was a rolling tent camper; no black or gray water tanks were on this camper; we had a blue tote on wheels receiving our gray water which when full we hooked to the back of our pickup truck and rolled the tote to the campground dump station. For everything else which was classified black water, we used the campground shower/rest rooms. What pissed me off was the people in the camping lots next to me would pull their tents out of their cars, pitch the tents, and set up camp for cooking; after they would wash their dishes in a large plastic container, the tent campers would throw their "gray" water in the bushes behind their camp site. But because our tent camper was on wheels, we had to collect our gray water and take it to the dump station, as per South Carolina Parks regulations. Gray water is mostly comprised of water and soap (probably low phosphate soap). Just don't see how it hurts the environment; to me, animal droppings in the forest are worse. Getting to my point, until your new gray water tank is installed, may I suggest you purchase a bucket with a tight lid from Home Depot; when you stop for your nite camp in an outlying rural area, put the bucket outside under your gray water outflow, cook, wash dishes for the night, and toss the bucket of water in the bushes. A lot of people will disagree with me on this, but I don't care; I even water my shrubs in the backyard with gray water from my camper when we return from a short trip, and those shrubs are thriving. The only problem I see is that you are headed for the state of Oregon; that state is at the top of the list for environmental regulations and enforcement. I totally agree with Dee! When I was a kid my dad built a camper and all our gray water got tossed out the door as did everyone else's and those forests are still standing. You will get this leak fixed eventually and until then I am sure the environment can absorb the little bit of waste water you produce. Sorry, I do not know what a "gushing tank? is? OK, I'll give the bushes technique a try! You may have given me the wrong URL. When I followed your URL it took me to an Inside Edition story.